I travel all the time and people (including me at times) use that as an excuse to eat crappy. These healthy plant based snacks are available on the road at most gas stations, airports, and truck stops. Almonds ¼ c *: Raw, unsalted nuts are the healthiest for you. Also check added ingredients as some brands add oils, flavorings, MSG, etc. Apple*: Not only are apples packed with nutrients, they are also a natural mouth freshener and will clean your teeth with every bite. Avocado (on sale): This is a healthy alternative when you are craving something smooth and fatty like ice cream. Baked Sweet Potato: Packed with SO many vitamins and minerals. Could be considered one of the healthiest foods out there. Plus they are very filling if you are a little hungrier than usual. Banana*: One of the least expensive fruits out there. Go ahead, eat two or three! Berries ½ c: Frozen berries are just as healthy, last longer, and are usually less expensive. So you may even get 1 c for your $1. Broccoli 2 c: As with berries, frozen work well too. I just got a bag with 5 cups of broccoli for $2. Can of Black Beans: Or any kind of bean you like. Make sure you read the ingredient list as some brands will add salt, sugar, MSG, oils, and other additives. Can of veggies or fruit*: As with beans, check for un-necessary and unhealthy additives. Cantaloupe 1 c: About half the calories of most fruit so if you are cutting calories, this is a great option. Carrot Sticks: Another cost effective snack, you can typically get about a pound of carrots per dollar. Celery Stalks: Very low calorie, great for hydration and digestion. Clementine: Easy to peel if you are traveling and if you get them on sale, you can eat a few. Cucumber: Hydrating with electrolytes for a post-workout snack. Dates ½ c: High in minerals and calories if you need energy to get through your workout or work day. Figs ½ c: A great snack to curb your “sweet tooth” and like dates, great boost of energy. Garden of Eatin’ Chia Chips 1/3 bag: Organic, non GMO, and at most health food stores and big grocers. You can also buy on their website where you can find specials and coupons too. Garden of Eatin’ Multi Grain Chips: 1/3 bag. Grapefruit: Lots of healthy and disease fighting qualities. On the go? Peel like an orange! Grapes 1 c: One of my favorites but can get expensive. In season you can get a much better price. Green Beans 1 c: Eat cold for a crispy, fresh, healthy, low cal snack. Green Pepper: Much cheaper than red, orange, and yellow peppers. Justin’s Chocolate Hazelnut Butter packet: Great to take on airplanes, road trips, and bike rides. Justin’s Maple Almond Butter packet: You can buy online in bulk. LaraBar (on sale)*: LOVE these convenient bars made only of nuts and fruits. You can also buy online in bulk. Mixed Nuts ¼ c*: Mixed nuts are your healthiest nut option since you get the benefits of different nuts. Again check packaging for added crap. Mojo Bar (on sale)*: Super delicious treat for when you are craving something sweet. Double check ingredients as I am not sure all are 100% plant-based. Orange*: Easy to find and packed with vitamins. Peanut Butter on a celery stalk: For the salty and crunchy craving. Peanut Butter on a piece of Ezekiel Bread: Check ingredients as some PB have added trans-fats, sweeteners, and other oils. Peanut Butter on an apple slices: For the sweet and salty craving. Peanuts ½ c*: Especially check ingredients on package, peanuts tend to attract the most additives since they are the least expensive to manufacture. Pear: Add a pear to your snack list every once in a while, they provide a unique set of nutrients. Pineapple ½ c: Aids in digestion and low in calories. I love pineapple, but it can get expensive if not on sale. Pistachios ¼ c*: High in calories, but you can get shelled version to work off the extra calories!! Raisins ¼ c*: Great for digestive issues as raisins are very fibrous. Red/Yellow/Orange Pepper (on sale): I am so happy when these are on sale. Otherwise I stick with green. Snow Peas 2 c: One of the most nutritious of the vegetables and contain protein. Sugar Snap Peas 2 c: Also great for a crunchy and sweet…but low calorie snack. Terra Sweet Potato Chips ¼ bag: All natural, no trans fats, and delicious. Terra Sweets and Beets chips ¼ bag: Can get coupons from website too! Watermelon 1 c: High in electrolytes, low in calories, and full of anti-oxidents. There you have it! 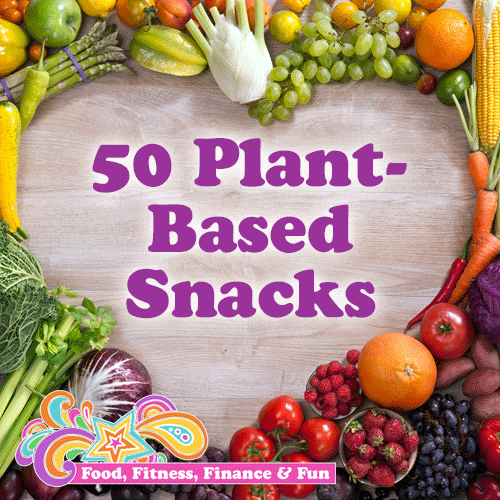 50 Plant-Based Snacks under $1…please leave a comment below if you have any others you would like to add!! !